I got the saw frame finished yesterday and glued up. This was the last bit that I was worried about being able to make, mostly because of the large finger joint between the arms and back. The key was doing a careful layout, working from the reference face on all the parts and assembling them the same way. Accurate sawing is important too of course, but the bandsaw fence took care of most of that. Once the points were cut and fitting well I added in the details. The arms taper in thickness from 1.125″ at the saw back to 0.5″ right before the wounded ends. I also cut a step in the arms (in use this is where you hold the saw, not at the knob) and a curvy-swoopy thing in the back of the saw. Is that an Astragal? No, that’s not right. Cyma Recta? I think that’s it. Or Curvy Swoopy Thing. It will need the edges chamfered and a final sanding after gluing, but it’s sitting in the clamps right now. 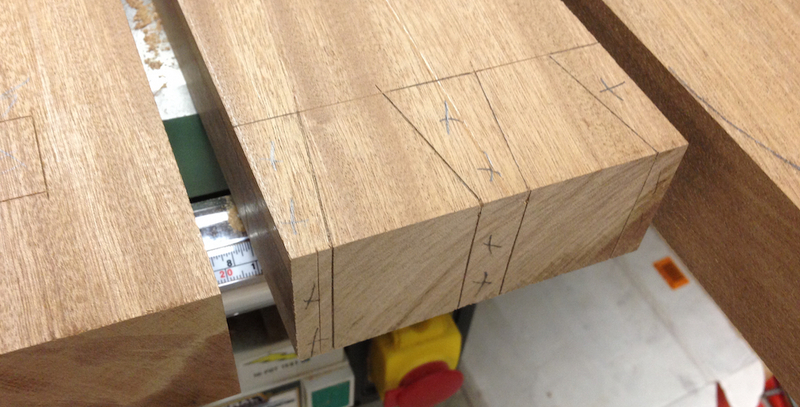 Glued up. 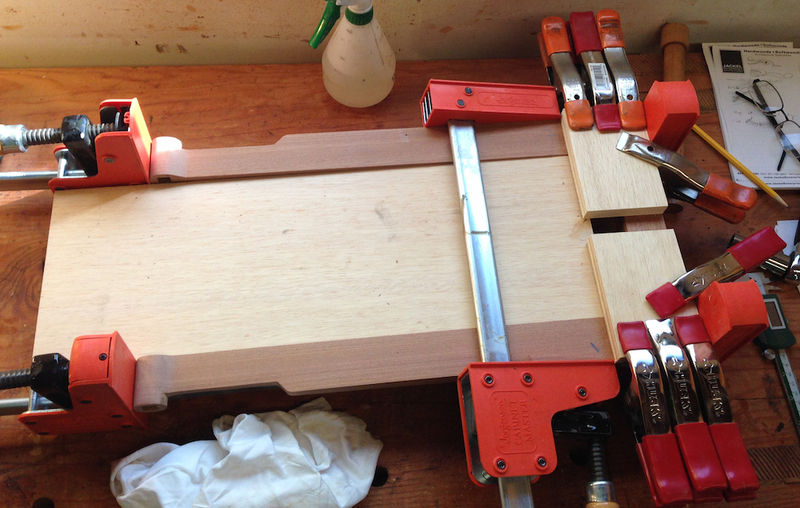 I need some shorter clamps, these 5 footers are a pain for small parts… The plywood in the center is to keep the arms parallel. With the saw frame mostly done (I need to add the gimbal brackets on the back, but it’s already morticed for them), I moved on to preparing the stock for the next major subcomponent — the seat. Once that is done I only need to make the clamp and clamp actuator and I’ll be done. 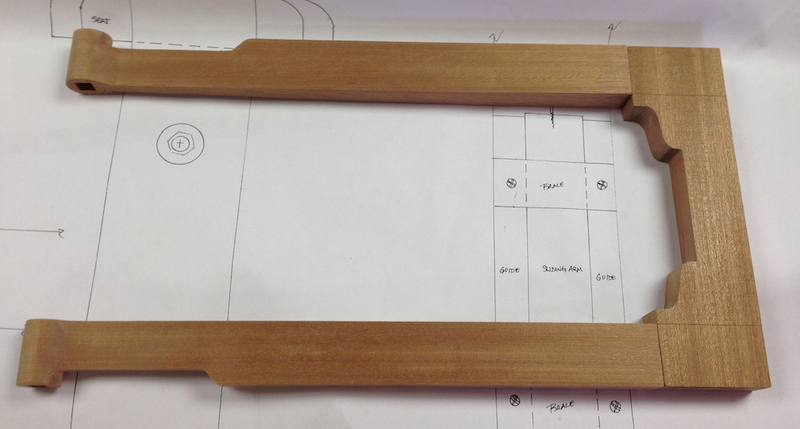 The seat parts are all 1.75″ thick. 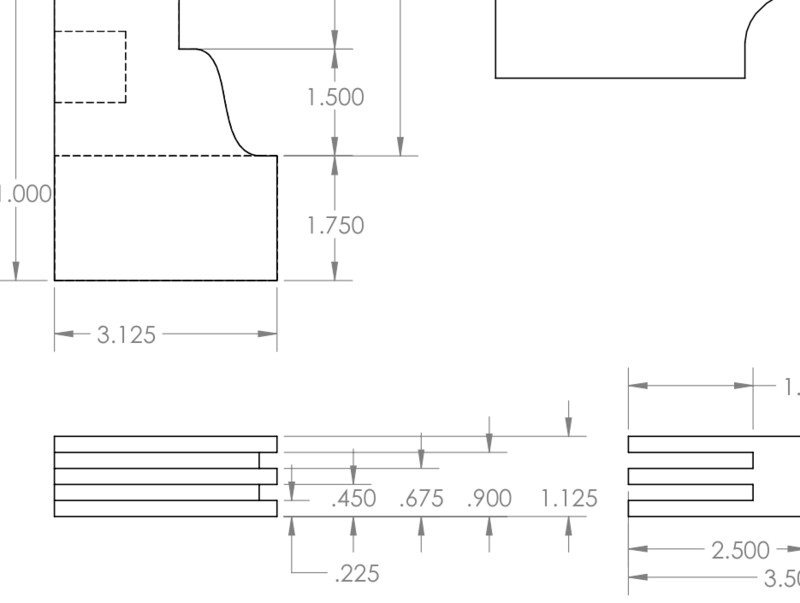 I dimensioned the lumber, and laid out all the joinery from my drawings. 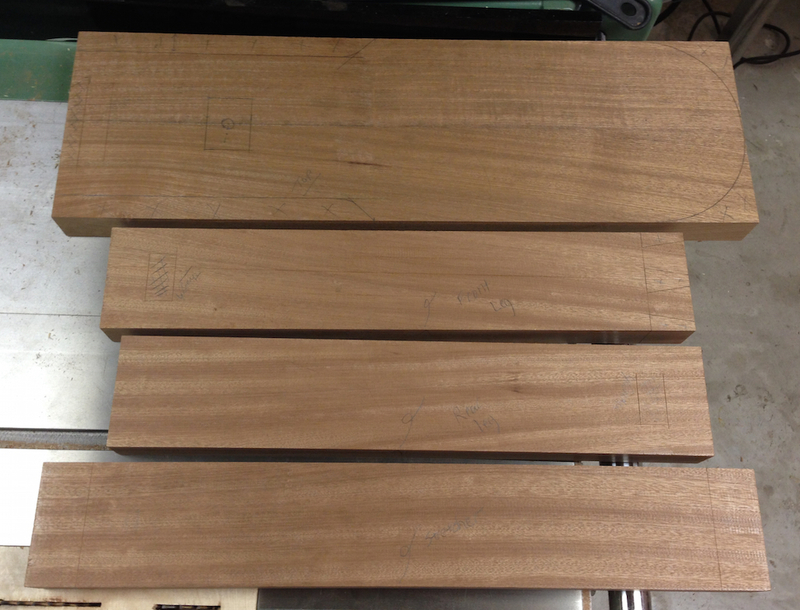 Next time I get to work in the shop I should be able to cut and fit all of this, it’s all straightforward (if large). Parts for the seat assembly. From the top: seat, front and rear legs, lower stretcher.